It is heart wrenching to imagine animals spending their entire lives in small cages and whose sole purpose is to be used for experiments. 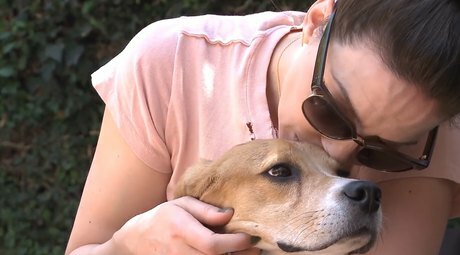 Ten Beagles were recently rescued from a research clinic in South Korea. Of the 10 rescued, 5 were brought to Los Angeles.They all spent the entire 6 years of their lives in metal cages, and a camera recorded it all as they stepped onto grass for the first time. This all happened thanks to the Beagle Freedom Project, a non-profit U.S. organization that helps free research animals. They have already helped to free thousands of dogs and are not slowing down. Some of the dogs could not get out of their cages fast enough. Others, were untrusting and took a little time to gain the confidence to step outside. This is not the first time we’ve seen video like this from The Beagle Freedom Project and it’s not going to be the last but it is a beautiful site to see every time it happens and reminds us of all the other animals, still in testing, that deserve the same freedom! Would you like to be able to find out if a product is cruelty free and help raise money for the Beagle Freedom Project at the same time? The Beagle Freedom Project has a new Cruelty Cutter app available for purchase and by scanning a barcode you can find out the animal testing status of that product. It’s almost too easy today. Why not support ethical companies, when you can do it this easily? Follow The Beagle Freedom Project on Facebook, Twitter and visit their website.